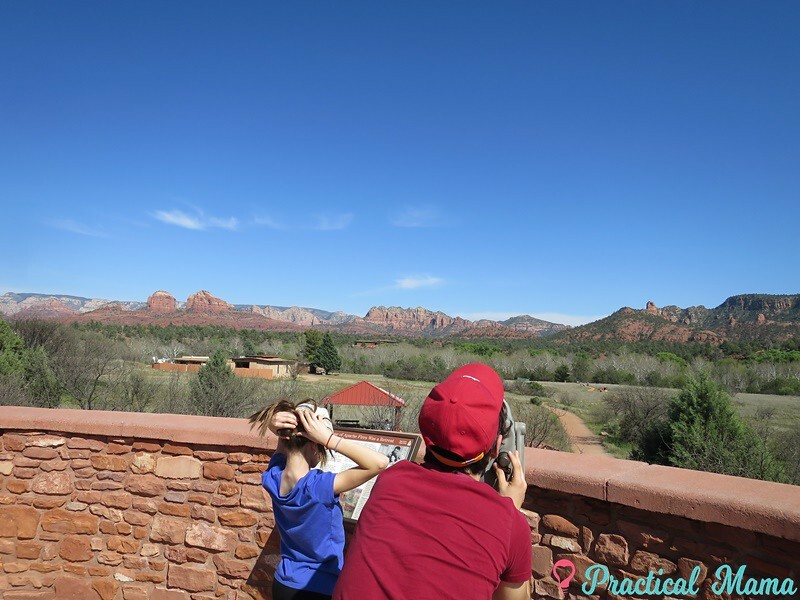 After our 3-day stay in Phoenix, we drove to Sedona for the rest of our trip. Phoenix was fun but Sedona was otherworldly. 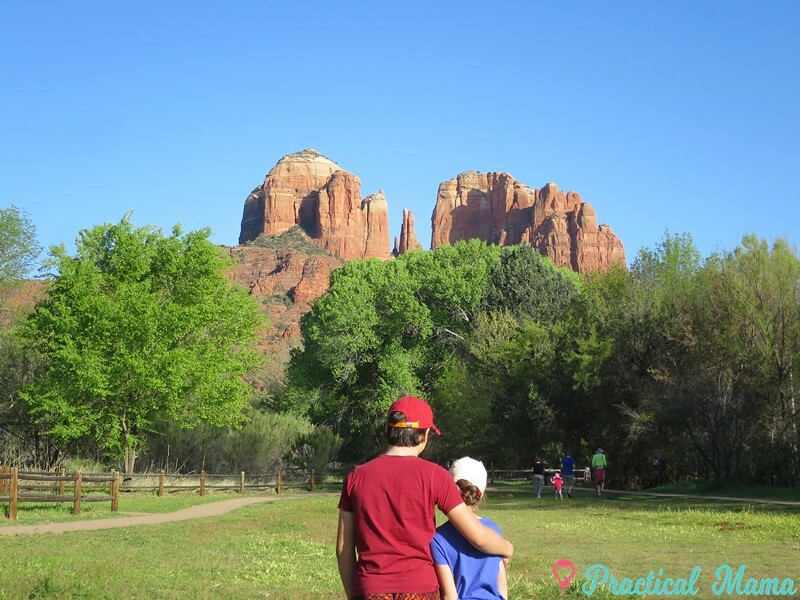 If you’re looking for ideas for things to do in Sedona, AZ with children, here is what we did…..
We stayed at Andante Inn of Sedona which is located on the main state route in the middle of Sedona overlooking amazing red rock formations. It had a small pool and the weather was relatively warm, so we planned our daily itinerary so that kids would take a dip in the pool and we would rest in the afternoon . 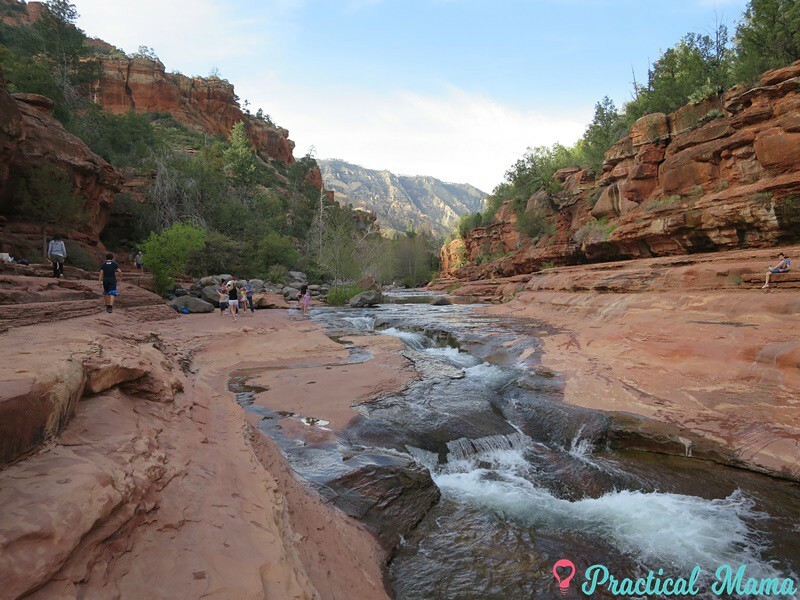 One day, we took a day trip to visit Grand Canyon, Antelope Canyon and smooth water rafting through Grand Canyon. After we checked into our hotel and ate lunch, we took a short drive to Red Rock State Park. When you search these natural parks on the map of your smartphone, add “parking” at the end, otherwise directions might take you to remote places. When you park your car, you can pick from the hiking paths of your choice. We took House of Apache Fire trail. The hiking trails that we could see here were pretty easy. The view from the House of Apache Fire and other scenic points along the way was breathtaking, or so we thought before we went over to Red Rock Crossing, Cathedral Rock. Red Rock Crossing overlooking Cathedral Rock is most probably the most recognizable place in Sedona. We unintentionally drove here at the best time, right before sunset to view the Cathedral Rock turn bright orange/red. 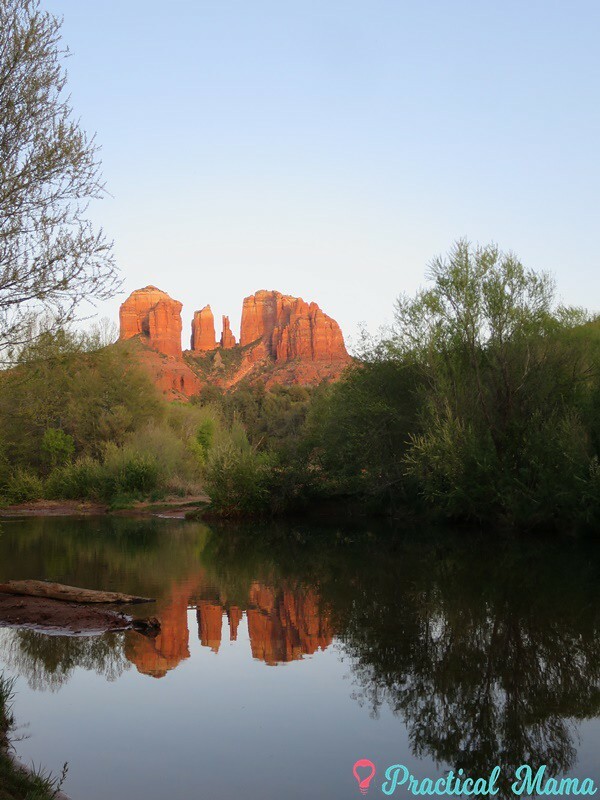 You’ll need to drive to “Crescent Moon Picnic Site” and follow the trail to Oak Creek, Red Rock Crossing to catch the best view of the Cathedral Rock at sunset. 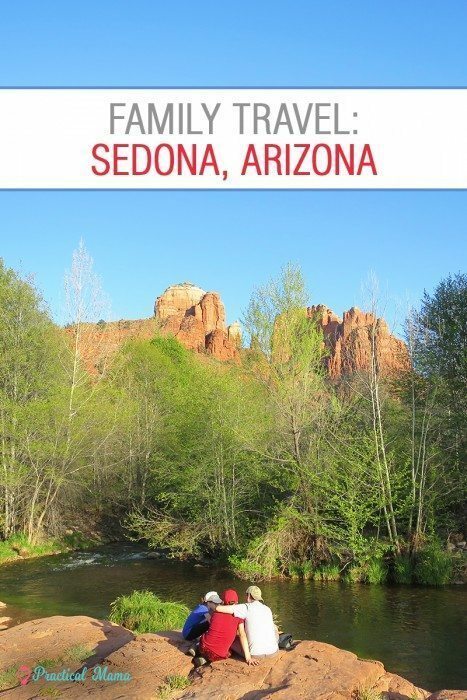 When you visit Sedona, you’ll enter the world of New Age, with vortexes, metaphysics, crystals and even UFOs. Vortexes are locations in Sedona which are believed to be centers of energy which are conducive to healing, meditation and transformation. This spot on Oak Creek is one of them, which is named Cathedral Rock Vortex. There were a lot of people sitting by the creek here meditating and journaling. We took our famous shot of Cathedral Rock over the creek by the sunset. Even though it looks empty, behind me were a flock of photographers. On our second day, we took a trip 1,5 hours away from Sedona to Meteor Crater . On the way we stopped at Oak Creek Overlook Vista. Meteor Crater is a meteorite impact crater, 2.4 miles in circumference and more than 550 feet deep. A meteorite is believed to have created this crater about 50,000 years ago. It was very well preserved. We joined the guided rim tour and kids were amazed by the geological details of the area. Our guide was a member of the local Native American tribe and was very insightful. His his story of how he became a geologist was very interesting. This crater was initially believed to be a volcanic crater because there were many other volcanic craters nearby, but later it was proven that this crater was caused by a meteorite. A huge piece of the meteorite is also in exhibit at the visitor center, which had many other interesting exhibits about meteorites and geology. A small piece of the meteorite is in Adler Planetarium. 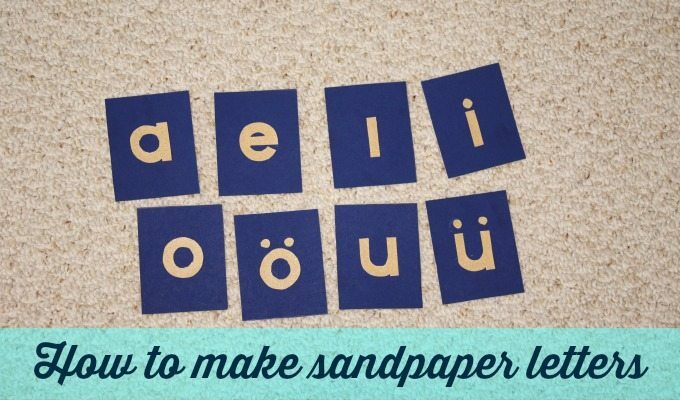 This is a must visit destination with or without kids. Petrified forest national park was a park known for its fossils especially of fallen trees that lived in the Late Triassic period of the Mesozoic era, about 225 million years ago. 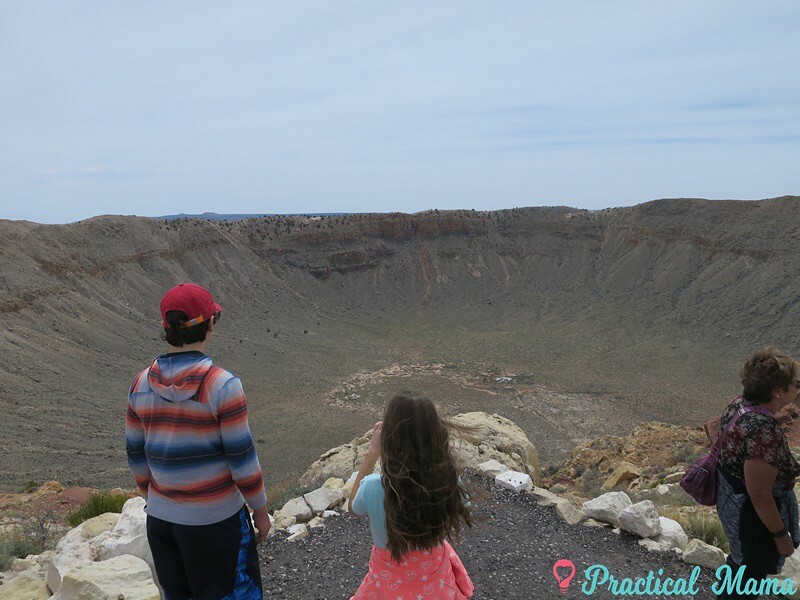 It was an hour away from the Meteor Crater and we felt that 1,5 hour drive to and fro was enough for the day so we didn’t visit, but it was on out bucket list for another time. On our way back from Meteor Crater to Sedona, we stopped at Slide Rock State Park. If you are traveling on a warm day, bring your non slip water shoes, swimsuit and towels. We skipped getting wet but watched other people slide down the creek as we hiked up the creek as far as we could go. Seeing the red rock formations and iron oxidization on the rocks close up was extraordinary. 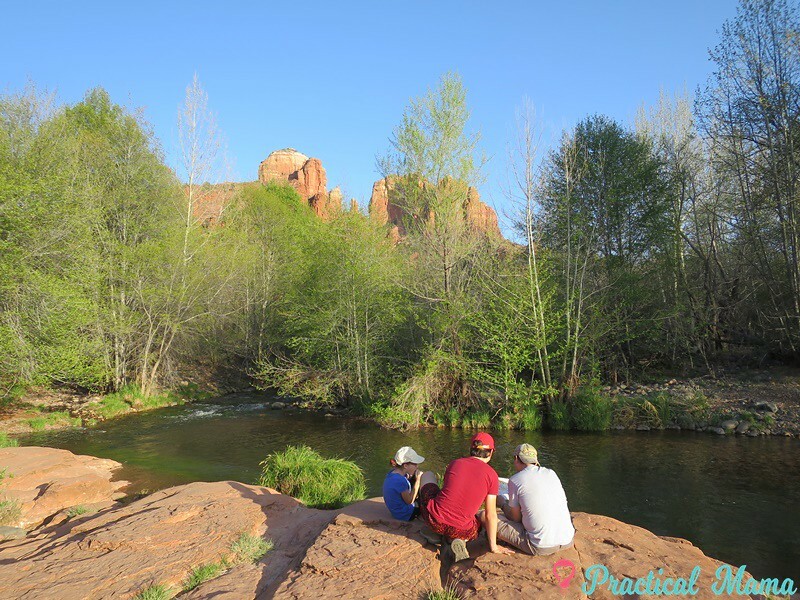 There are many scenic vista spots in and around Sedona and Huckaby Trail Vista is one of them. 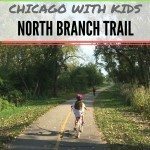 You can also hike on the trail as well. We planned our 3rd day to start in Sedona and end at Grand Canyon National Park, so that we would be able to wake up early for our tour the next day. We decided to hike up the Bell Rock but the parking lot was full so we drove around and found empty spots at Yavapai Point parking lot. It turned out to be an amazing trail and had gorgeous views of the Bell Rock. My kids reenacted the famous scene from the Lion King as we took a break on the trail. Then we passed by The Chapel of the Holy Cross. It is a architecturally recognized church constructed on the rocks. The parking lot is limited and people usually park on the way down and walk up to visit the church. Going towards Grand Canyon we took a detour and visited Sunset Crater Volcano National monument. It is an hour away from Sedona, past Flagstaff, AZ. There are few trails around and through the crater. We took a short hike through the Lava Flow Trail and to be walking on volcanic rock was mind blowing. 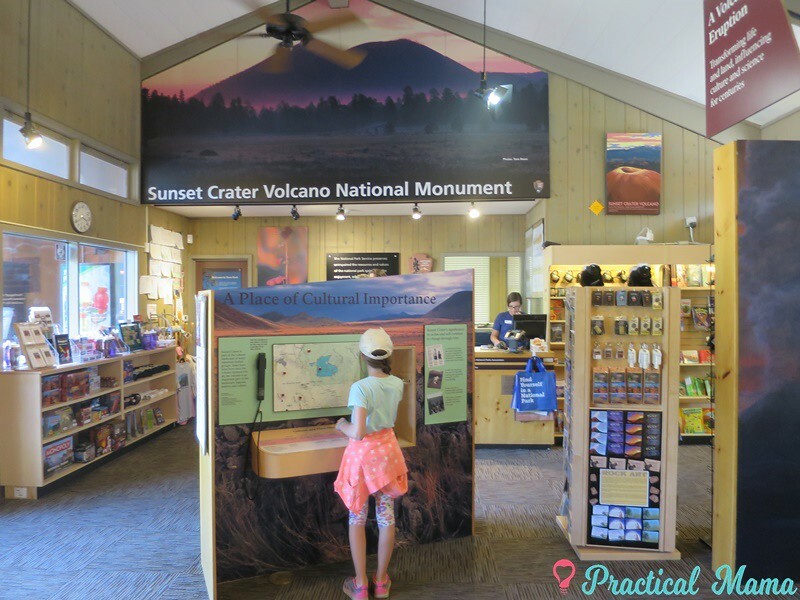 Visitor center is great for kids. We turned back and stopped at Lowell Observatory in Flagstaff, AZ. The view of the town from the hill where observatory was located was amazing. We visited the observatory but couldn’t stay for after dark events even though we really wanted. 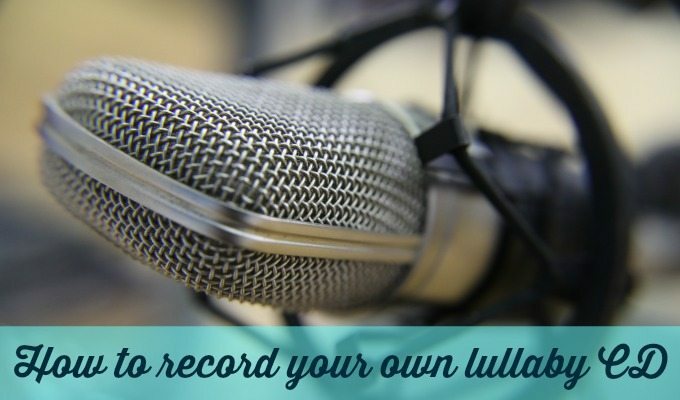 We had to go to bed early for a very early morning flight the next day. We stopped at the tiniest theme town called Williams, AZ to have diner before we got to our hotel. The whole town is open air theme park looking like Radiator Springs in Cars movies. We had dinner at Cruisers Cafe 66 and then headed towards our hotel near Grand Canyon National Park. There are many activities, little museums and cute stores in town to keep you busy at least half a day. 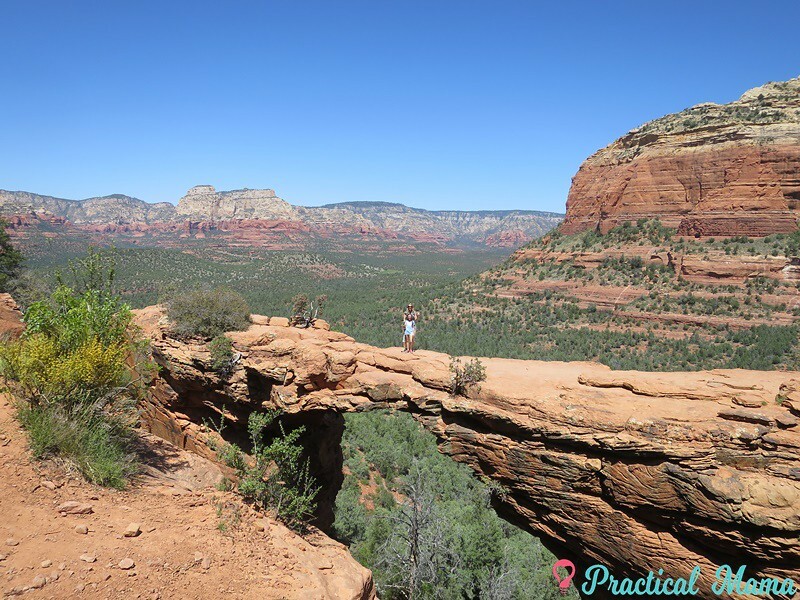 We started our last day in Sedona with the craziest hike of all. I’m glad we did it in the morning of the last day. 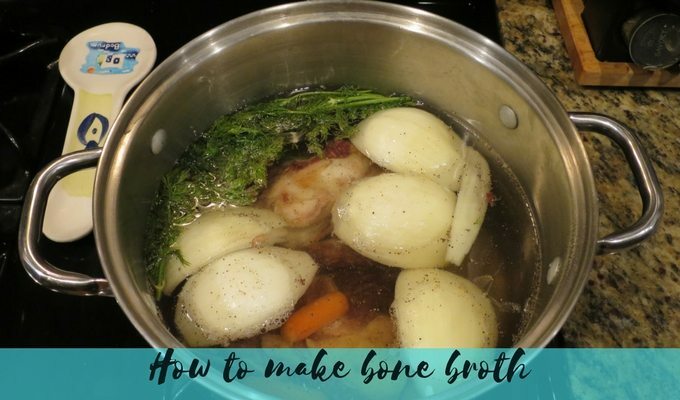 It was comparable to our hike up the Camelback Mountain with a twist at the end. Devils’ Bridge. This scenic and dangerous looking bridge is very popular. When we reached the top where the bridge was, my son refused to get nearby. My daughter hesitated at first but then she joined me to wait in the long line to have our photos on that rock bridge. Devil’s Bridge is an extending rock from the mountain. It looks very narrow from the mountain side. 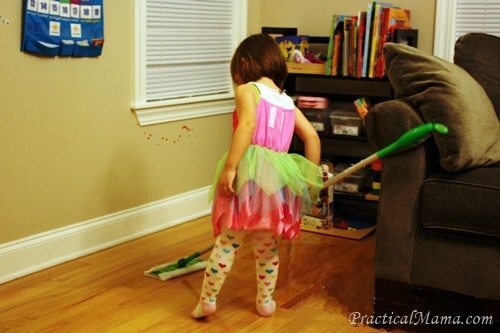 People with height issues or anxiety had even trouble looking at other people walking on it. Even though it was wider than it looked, I also gasped as I watched few crazy hikers doing headstand and wheel pose on it. We waited, posed, returned to go down the trail. It is a half-a-day hike. After our hike, we spent the rest of the day in Sedona downtown. We had lunch in one of the restaurants with the best scenic view in town called Sound Bites Grill. Then we walked along the main street of the downtown, visiting stores, purchasing spiritual souvenirs and crystals. 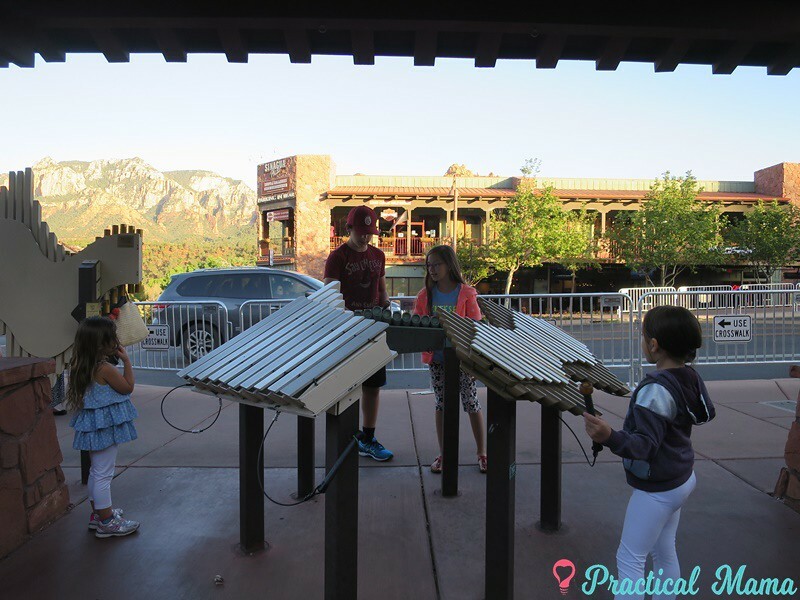 Kids played with the musical instruments including xylophones, chimes and marimbas which was setup on the sidewalk on Main Street. 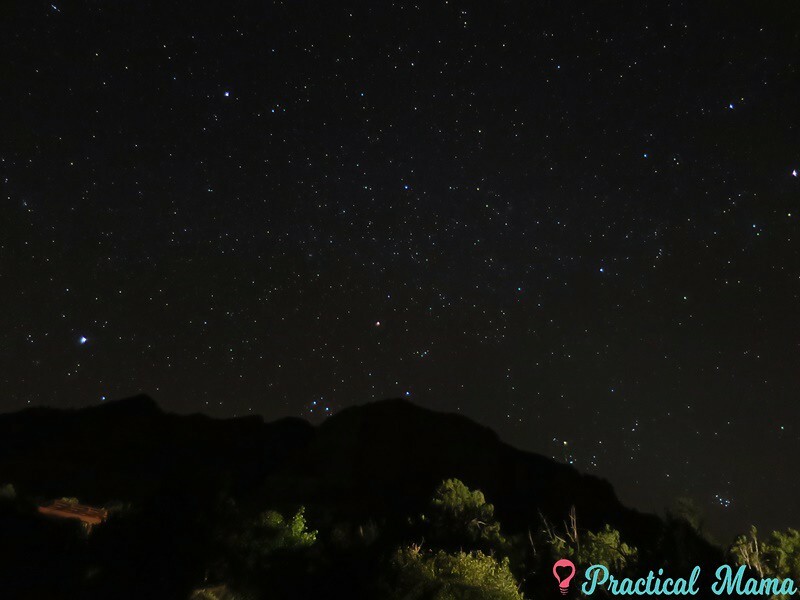 On our last night, after dinner, we went back to Yavapai Point parking lot and gazed at the stars. When I researched our options, I found many companies offering stargazing tours but they were really expensive for our budget. Sedona is one of the least lit towns in the US. We decided to drive out of town enough to get to a really dark spot and park at a safe area, so picked Yavapai Point. Besides the occasional cars coming in the parking lot, it was practically pitch black except for the stars. We used Sky View Free app on my iPhone to identify starts and constellations. 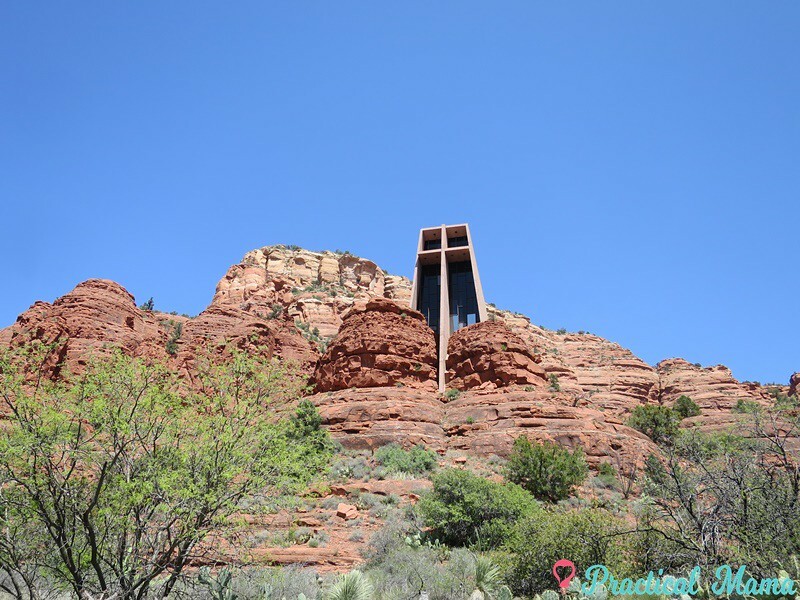 As I mentioned at the beginning on this post, Sedona was a place out of this world compared to all the places I’ve visited so far. 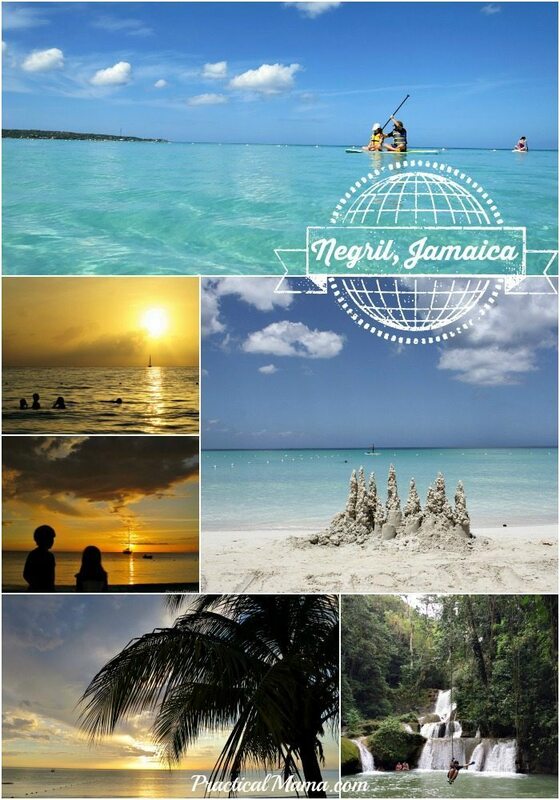 I have seen many unbelievable natural beauties and clear night skies that I’ll never forget. One of the two landmarks we wanted to visit but couldn’t during our stay was Montezuma Castle. 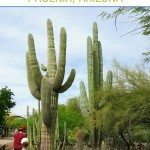 It is a well preserved which were built by Sinagua people, a pre-Columbian culture closely related to Hohokams which built Pueblo Grande site in Phoenix, AZ. The Verde Canyon Railroad is a heritage railroad running between Clarkdale and Perkinsville near Verde Canyon. The passenger excursion line operates on 20 miles (32 km) of tracks. The ride is about 4 hours. 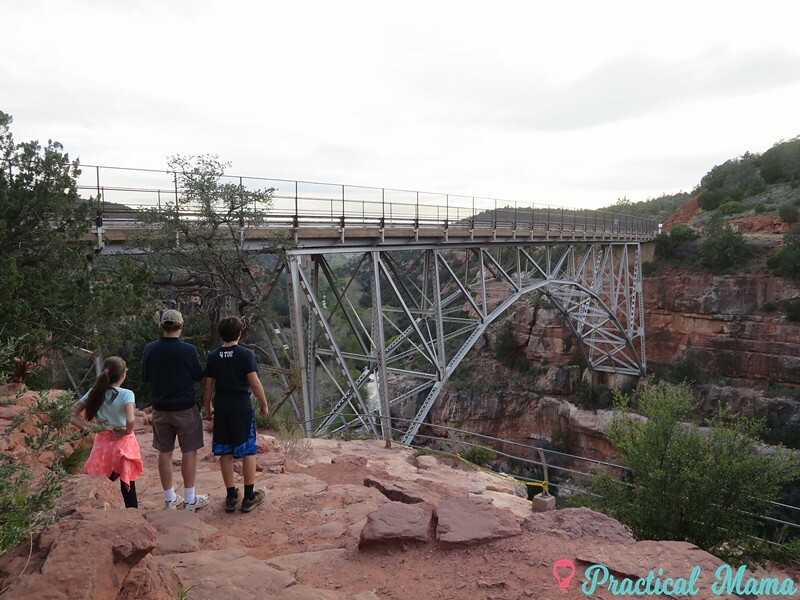 The first class has comfortable seating with sofas and panoramic views of stunning canyon walls, the Indian ruins, the Verde River and the majestic wildlife. 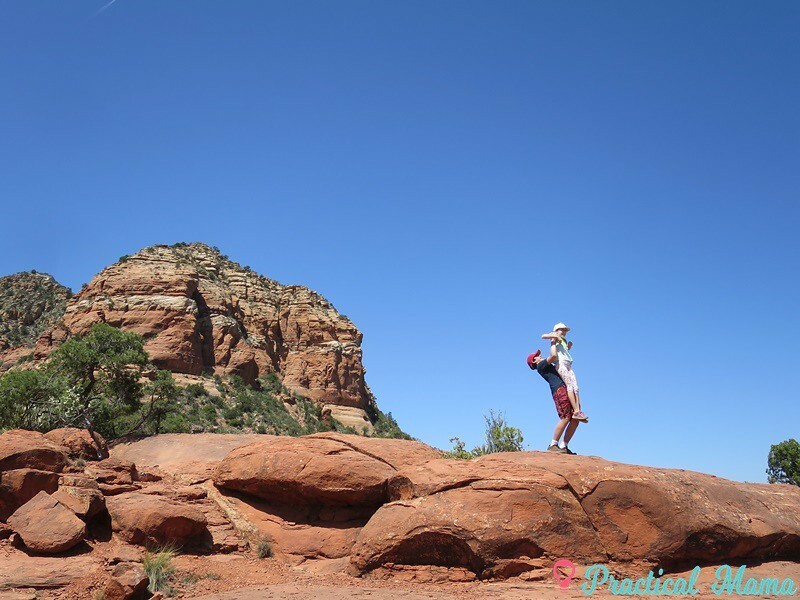 You can see all of our photos from Sedona, AZ in this album.